Mary Patricia (Pat) Murray was born in 1925 in Wisconsin, the only child of Dr. Joseph and Mrs. Edna Murray. She received a Bachelor of Science degree from Ripon College in 1944 and a Certificate in Physical Therapy from the Mayo Clinic in 1945. 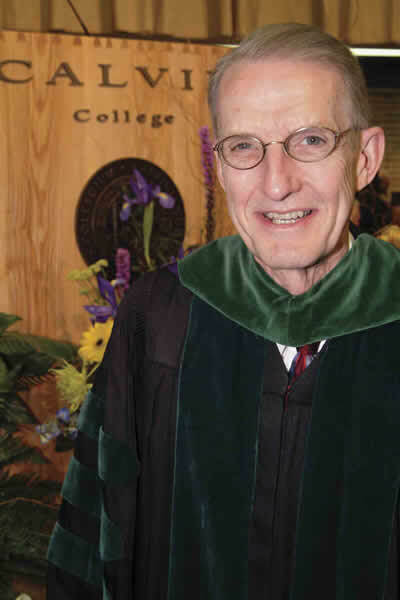 Later, Dr. Murray received a Master of Science in Anatomy in 1957 and a Ph.D in Anatomy in 1961. Both degrees were awarded by Marquette University. As World War II was coming to an end in 1945, Pat was beginning her career in physical therapy as a staff physical therapist. She took her first position at Curative Workshop of Milwaukee. In 1948, she became a staff therapist at the Veterans Administration Medical Center, Wood, Wisconsin. 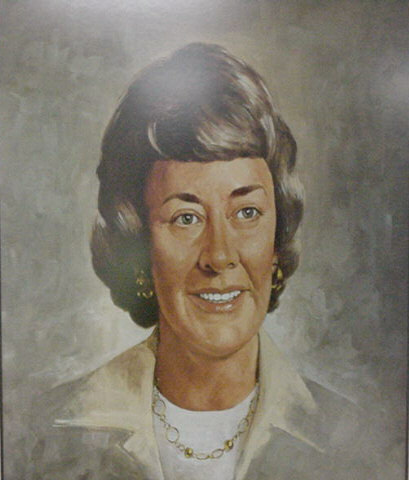 She was promoted to Supervisor in 1951, Assistant Chief in 1953, Clinical Training Supervisor in 1955, and Education and Research Supervisor in 1959. Her clinical training program became a model for similar programs throughout the Veterans Administration. Although the progression of Dr. Murrayís career took her out of clinical practice, she never lost sight of the concerns and challenges that face physical therapists. Her identity as a physical therapist remained the keystone of her career as a researcher and educator. Dr. Murray taught kinesiology to physical therapy students at Marquette University in Milwaukee, Wisconsin from 1954 until her death in 1984. In addition to being an extraordinary teacher, Dr. Murray was a world-renowned researcher, respected especially for her measurement of normal and abnormal walking. Her commitment to the profession of physical therapy has inspired many persons to pursue their own careers with extraordinary vigor and excellence. In 1964, Dr. Murray created the Kinesiology Research Laboratory at the Veterans Administration in Milwaukee (formally Wood), Wisconsin. She was the Chief of this highly respected and fully funded laboratory for 20 years, until her death. Adapting a century-old technique using interrupted light photography, she developed a method for measuring the total movement pattern of normal human gait, from infancy to old age. She was one of the first researchers to measure the kinematics of body segments in multiple planes during walking. Her pioneering research in the area of normal gait served as a foundation for many subsequent studies in other laboratories around the world. From a strong understanding of the normal gait pattern, Dr. Murray progressed to studying gait disturbances in persons with neuromuscular and musculoskeletal pathology. Her work in this area included longitudinal studies to assess therapeutic interventions, such as joint arthroplasty and the design of prostheses. Her background as a practicing physical therapist clearly influenced her decision to measure many aspects of gait and related activities, including muscle strength, center of pressure, posture, range of motion, and forces applied to canes and crutches. In the classroom, Dr. Murray had a demanding but inspiring presence. She expected students not only to work very hard in their studies, but, more importantly, to accept only that which was founded on evidence and critical thinking. She was always generous with her time, willing to rephrase an answer, and patient in helping the interested to understand. As one ex-student said: Having Dr. Murray as an instructor for kinesiology remains one of my fondest memories as a student at Marquette University. In addition to her commitment to physical therapy education, Dr. Murray also taught medical students, orthopedic and rehabilitation medicine residents, and graduate students in biomedical engineering. At the time of her death, she held faculty appointments in the Physical Therapy Program (as full Professor), Biomedical Engineering, and the Graduate College at Marquette University. In addition, she was a full Professor at the Medical College of Wisconsin in both the Departments of Physical Medicine & Rehabilitation and Anatomy. Dr. Murray believed strongly in the value of an interdisciplinary approach to research. While clearly taking the role as leader, Dr. Murray worked closely with other physical therapists, engineers, and technicians trained in the tedious, exacting measurements required during the pre-computer era. For any given project, this team included orthopedic surgeons, physiologists, neurologists, and gerontologists. As a team member herself, Dr. Murray was an intense listener to those around her, always wanting to understand in greater depth in order to explain with greater clarity. Dr. Murray died from cancer in the Spring of 1984 aged only 59. 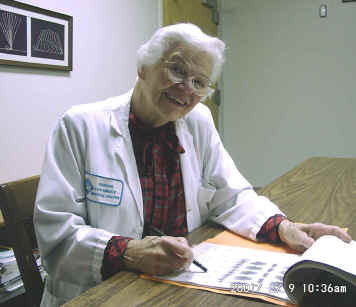 She dedicated much of her life to establishing both credibility and accountability to the practice of physical therapy. Throughout her career, she continued to weave together her roles as a physical therapy educator, researcher, and clinician. There were no clear lines separating these roles. Rather, they were blended facets of a remarkable woman. Murray MP, Kory RC, Sepic SB: Walking patterns of normal women. Archives of Physical Medicine & Rehabilitation. 51:637-650, 1970. Statham L, Murray MP: Early walking patterns of normal children. Clinical Orthopaedics & Related Research. 79:8-24, 1971. Murray MP, Kory RC, Clarkson BH: Walking patterns in healthy old men. Journal of Gerontology. 24:169-178, 1969. Murray MP: Gait as a total pattern of movement. [Review] American Journal of Physical Medicine. 46:290-333, 1967. Murray MP, Kory RC, Clarkson BH, Sepic SB: Comparison of free and fast speed walking patterns of normal men. American Journal of Physical Medicine. 45:8-23, 1966. Seireg AH, Murray MP, Scholz RC: Method for recording the time, magnitude and orientation of forces applied to walking sticks. American Journal of Physical Medicine.47:307-314, 1968. Murray MP, Clarkson BH: The vertical pathways of the foot during level walking. II.Clinical examples of distorted pathways. Physical Therapy. 46:590-599, 1966. Murray MP, Sepic SB, Gardner GM, Downs WJ: Walking patterns of men with parkinsonism. American Journal of Physical Medicine. 57:278-294, 1978. Murray MP, Spurr GB, Sepic SB, Gardner GM, Mollinger LA: Treadmill vs. floor walking: kinematics, electromyogram, and heart rate. Journal of Applied Physiology. 59:87-91, 1985. Murray MP, Seireg A, Scholz RC (1967) Centre of gravity, centre of pressure and supportive forces during human activities. J Appl. Physiol. 23: 831-838. The sone of a missionary, Dr. Sutherland was born and educated in Shanghai, China. As Chief of Orthopaedic Surgery at the Children's Hospital of San Diego, he established one the first motion analysis laboratories in 1974. The team performed a comprehensive study on the maturation of walking in normal children, with over 400 studies on a total of nearly 300 children in ten age-groups from one to seven years. Dr. Sutherland built on the gait cycle division described by Jacqueline Perry, but substituted three periods of stance: initial double support, single limb stance, and second double support. Sutherland, D, Olshen R, Biden E, Wyatt M (1988) The Development of Mature Walking, Cambridge University Press. Sutherland, D (2001) The evolution of clinical gait analysis part 1: kinesiological EMG", Gait and Posture, Vol 14, pp 61-70. "GK" was born on the 28th April 1916 and died on 13th November 1999. Traditionally known as "the curse of celts", Neural Tube Defects are at least twice as common in people of Celtic ancestry (the national incidence of spina bifida was 2.8, whereas in North Wales it was 4.2 per 1000 live births). Thus, Gordon Rose founded ORLAU (Orthotic Research and Locomotor Assessment Unit) at the The Robert Jones and Agnes Hunt Orthopaedic Hospital at Oswestry, Shropshire (near the Welsh border) in 1975. A particularly strong motivation was the work of Lorber - a paediatrician - who showed how ineffective was the treatment for mobilisation of myelomeningocele patients at that time, and Jacqueline Perry at Rancho Los Amigos in California. It was his extended visit there that enthused him with the potential of gait assessment to improve the effectiveness of treatment for walking disorders. He recognised the need for the integration of surgery, physiotherapy and effective orthoses to enable severely disabled patients to experience the therapeutic and functional benefits of walking. To make that possible he resolved to pursue a multidisciplinary approach and set about overcoming the obstacles to a concept which, at the time, was revolutionary. With characteristic foresight he created ORLAU as a team with a multiplicity of talents and professional influences. He established the first clinical gait assessment service in the UK, and of treatment with multidisciplinary regimes of surgery, physiotherapy and rehabilitation engineering. Research was an underlying principle, and a number of walking aids - Swivel Walkers, Parawalkers - were developed. Gordon was honoured in 1981 with the award of an OBE. The first video force vector generator was designed at ORLAU in July 1979 by John Tait. An attempt had been made previously in the US, using a complicated optical arrangement of oscilloscope and half silvered mirror to superimpose the vector on cine film, but this was the first TV version. With John Stallard, the Swivel Walker was designed. Rose, G. K., Butler, P. and Stallard, J. (1982). Gait - principles, biomechanics and assessment. ORLAU Publishing, Oswestry. Rose, G. K. (1983). Clinical gait assessment: A personal view. Journal of Medical Engineering and Technology, 7 (6): 273-279. Rose, G. K. (1986). Orthotics: Principles & Practice. Book published by William Heinemann Medical Books, London. Farmer IR, Poiner R., Rose GK, and Stallard J. Reciprocal Walker. Patent Specification No. 1 571 392, published 16th July 1980 (provisional patent filed 27th April 1976, complete specification filed 1st February 1977). 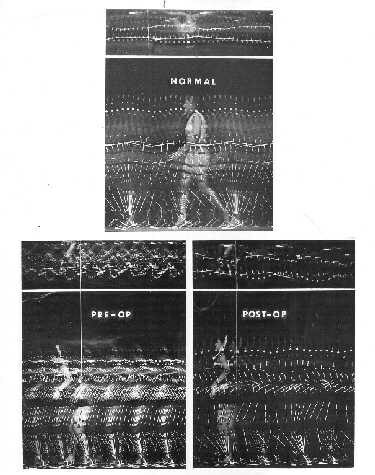 Tait JH and Rose GK (1979) The real time video vector display of ground reaction forces during ambulation. Journal of Medical Engineering & Technology, 3 (5): 252-255. Professor Paul studied at the Royal College of Science and Technology, Glasgow (which became the University of Strathclyde) leading to a degree in mechanical engineering from the University of Glasgow. He obtained his PhD under the same arrangement between the 2 institutions. His thesis was concerned with the measurement of the forces in the hip joint during walking. This work was greatly received because it followed John Charnley's first successful hip joint replacement. The gait work at Strathclyde began after a visit by Inman's Berkeley team. Notable developments were the 3D Vicon motion analysis system, designed by Prof. Paul with his PhD students, Mick Jarrett and Brian Andrews. Other important contributions were made by Jim, Morrison, Stefan Solomonides and Sandy Nichol. 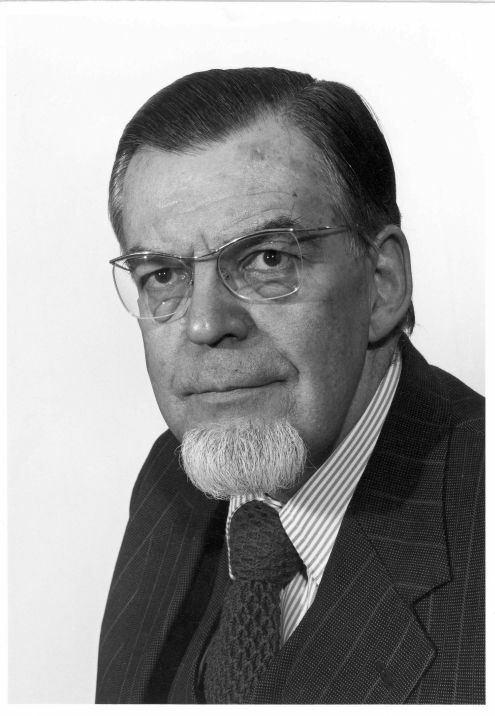 Prof. Paul was head of the Wolfson Bioengineering unit at the University of Strathclyde from 1982 until 1995, and was president of the International Society for Biomechanics from 1987 to 1989 and delivered the Muybridge Lecture' to open the Biannual meeting of that Society in Tokyo. Paul J P (1967) Forces transmitted by joints in the human body. Proc Inst Mech Eng V181: 3J,8-15. 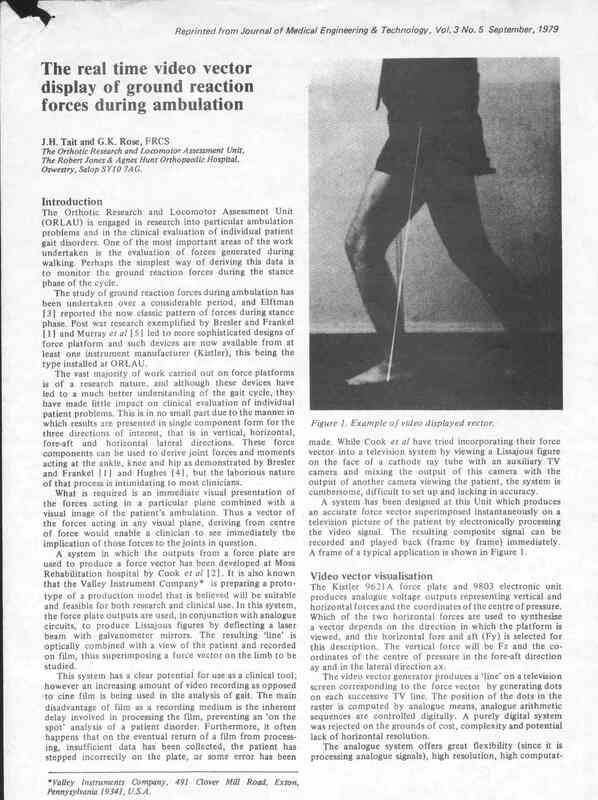 Paul J P (1970) The effect of walking speed on the force actions transmitted at the hip and knee joints. Proc Roy Soc Med, 63 2, 200. Paul J P (1975) Force actions transmitted by joints in the human body. Proc Royal Soc, London B, 192, 163-172. David Winter gained his BSc and MSc in electrical engineering from Queens University and his PhD in physiology and biophysics from Dalhousie University. Since 1958 he has held academic appointments at the Royal Military College, Technical University of Nova Scotia, University of Manitoba and the University of Waterloo. In 1969 he established the first clinical gait laboratory in Canada at the Shriners Hospital in Winnipeg. 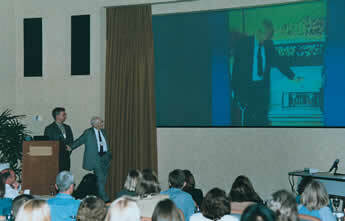 In 1999 he was made an Honorary Member of the International Society of Biomechanics. He is currently a Distinguished Professor Emeritus at the University of Waterloo. His book Biomechanics and Motor Control of Human Movement is a classic work of the field, and pioneered many techniques which are still in use. Biomechanics and Motor Control of Human Movement, Second Edition. David A. Winter. Published by John Wiley & Sons, New York, 1990. A.B.C. (Anatomy, Biomechanics and Control) of Balance during Standing and Walking. David A. Winter. Published by Waterloo Biomechanics, 1995. 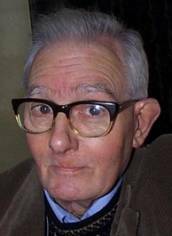 From 1970 to 1981 Antonio Pedotti was Professor of Automatic and Control. In 1975 he was an Associate Researcher at Berkeley, where he was introduced to the methods of Verne Inman and colleagues. Sponsored by the Don Gnocchi Foundation, and aided by Aurelio Cappozzo and Giancarlo Ferrigno, he developed the ELITE motion analysis system. He also developed the butterfly diagram of the ground reaction vector, which is hence often referred to as the "Pedotti diagram". He is now a professor of Bioengineering and Biomedical Technology at the Politecnico di Milano. 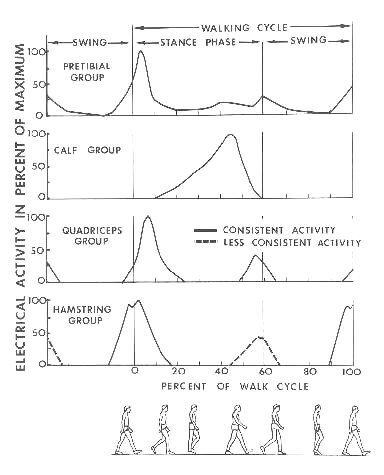 Pedotti A (1977) A study of motor coordination and neuromuscular activities in human locomotion. : Biological Cybernetics. (26) 53-62, 1977. Pedotti A (1977) Simple equipment used in clinical practice for evaluation of locomotion", IEEE Trans. on Biomedical Eng., vol. BME-24, n. 5, pp. 456-461. Ferrigno G and Pedotti A (1985) ELITE: A digital dedicated hardware system for movement analysis via real-time TV signal processing. IEEE Transactions on Biomedical Engineering, 32: 943. Electromyography is a seductive muse because it provides easy access to physiological processes that cause the muscle to generate force, produce movement, and accomplish the countless functions that allow us to interact with the world around us… To its detriment, electromyography is too easy to use and consequently too easy to abuse. After his gaining his B.A.Sc. from the University of British Columbia, he traveled to the University of New Brunswick for his M.Sc., and then stuied under John Basmajian (the father oif EMG) at Queens University, where he wrote his Ph.D thesis. He is currently Professor of Biomedical Engineering in the NeuroMuscular Research Center at Boston University, and Research Professor in the Department of Neurology. De Luca, C. J. (1997). The use of surface electromyography in biomechanics. Journal of Applied Biomechanics, 13, 135-163. Now Professor Emeritus of Biomechanics, Department of Physiology at University College London. Grieve DW & Gear RJ (1966) Relationships between length of stride, step frequency, time of swing and speed of walking for children and adults. Ergonomics 9: 379-399. Grieve, D.W., Cavanagh, P.R., & Pheasant, S. (1978). Prediction of gastrocnemius length from knee and ankle joint posture. Biomechanics VI-A (E. Asmussen & K. Jorgensen, eds. ), 405-412. Jim Gage was educated at Northwestern Medical College and joined the Newington Children’s Hospital staff in Connecticut in 1976 - promoted to director of the cerebral palsy service in 1978. The need for a more scientific approach led Gage to California to study the work of Verne T. Inman. The tedious nature of cine film at that time inspired Dr. Gage to establish a computerized system to automate the process. He approached Hartford-based United Technologies Corporation – an unusual choice given UT’s specialty in designing missile tracking systems. the head of the physical therapy department at Newington Hospital.’"
The original estimate for the project had been $150,000 - the revised estimate came back at more than $700,000: $500,000 for the research and computer equipment and another $200,000 for remodeling the physical space for the lab. United Technologies agreed to donate their research – a $250,000 gift. After a few basic experiments in UT’s lab, they came up with an elegantly simple solution: attach small round reflectors to the patient at the critical joints and muscles. The patient then walks down a 10-foot long measurement area while being videotaped by eight video cameras, six of which emit infrared light at 60 times per second, collecting information from those essential data points. Gage still needed equipment for the lab and money for the remodeling. Ken Olsen, founder and president of Digital Equipment Corporation agreed to sell the equipment needed for the lab at cost - $44,000 - and the lab opened in 1981. Dr. Gage moved on to be medical director of Gillette Children’s hospital in St. Paul, Minnesota, where he opened his second lab in 1987. Gillette’s gait lab is considered to be the busiest in the country. In 1997, more than 360 patients were given a full analysis in the lab, in addition to more than 80 patients who came to the lab for examination by video. Each gait analysis contains three person years of data using the manual processes from the late ’70s. Gage, JR, Ounpuu, S. (1989) "Gait Analysis in Clinical Practice." Seminars in Orthopaedics, 4, No. 2, 72-87. Gage JR (1991) Gait Analysis and Cerebral Palsy (McKeith Press) Blackwell, Oxford/UK & Cambridge University Press, Boston/New York.